I am sure I will never forget my day today - I undertook my first real casualty evacuation mission. The day started as just another day. I got up at 6:00 a.m. and after finishing early morning chores, I was well in time for the morning briefing at 7:30 a.m. By the time we had covered the meteorological forecasts and current weather with the ATC and signals state, I was really hungry and relished every bite of the excellent Breakfast at the Squadron Cafeteria. Within an hour we were done with the Mission briefing, checking the aircraft as well as the Administrative and Operational requirements of the Mission. At 10:00 a.m. we took off as per the planned mission. While we were in air, we received an unexpected message over the radio to divert to Jammu for a casualty evacuation. Further details were not given to us. After landing there, we learned that an Army Jawan had been seriously injured and needed immediate medical attention. He had sustained a bullet injury and other abdominal damages during a shootout at Jammu. 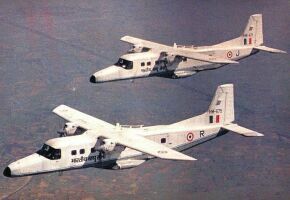 2 IAF Dornier Do-228s. These are manufactured in India by HAL. We quickly carried him with a medical attendant onboard, and started on our journey back. The jawan seemed to be in a critical condition. As we landed at Palam, he was immediately taken to the Military Hospital for treatment. We took an hour to carry out post landing checks and formalities. As I had an hour before dinner, I rushed to have a quick swim. Followed by a wash and change, I joined the other officers at the Mess. Though I am excited about my day today…I think I should stop writing my diary and crash into bed. Today, I learnt that the Jawan, which we had evacuated the other day, had survived. Though still under treatment, he will shortly be fit to resume duties. It was my first casualty evacuation mission and I'm glad that it went off successfully. It gives me an added sense of elation at having been able to help save a vital life.